Autumn Brown cites the prestige of the Brian Lamb School of Communication, as well as the numerous opportunities for career development, as her motivations for choosing Purdue. Autumn transferred to Purdue, and after initial challenges acclimating to a new university as a non-freshman, Brown wanted to help other transfer students, so she became the Transfer Chair of the Liberal Arts Student Council. 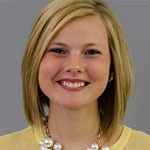 In that role, she founded Purdue Pals, a group that matches incoming transfer students with existing students by major. Brown will be the first student to go through a combined-degree program called 3+2, which allows students to achieve a communication degree in three years, and a masters in human resources in just two more years—in Autumn’s case she will get both degrees in just four and a half years. Throughout her time at Purdue, Brown has studied abroad as an intern in Cartagena, Colombia, where she learned the hiring process for a company in that country. She has been an ambassador at Purdue’s Center for Career Opportunities, and she is now the Vice President of Professional Development for Graduate Women in Business. According to Brown, the opportunities in the College of Liberal Arts have made her more culturally competent, enhanced her ability to communicate, and will enable her to be confident and successful when she begins her career in corporate HR.